Maritime Academy students from across East Arnhem Land spent four days learning firefighting, boat safety, life raft and water survival as part of a nationally-recognised ship safety course that offers students new pathways to employment. 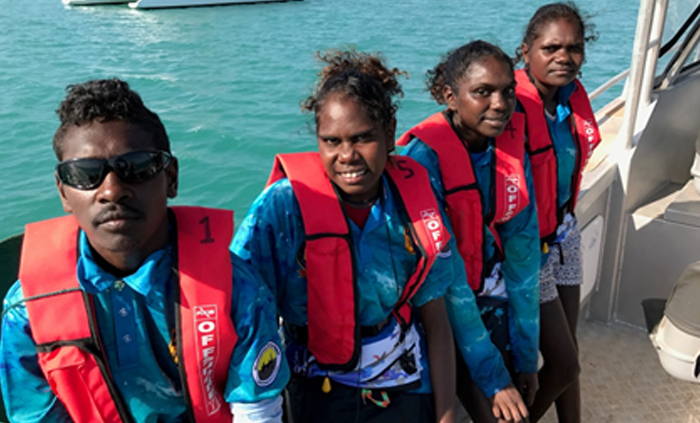 Students from Shepherdson College in Galiwin’ku, Nhulunbuy High School, Yurrwi School and Yirrkala School came together to complete the Elements of Shipboard Safety Course to equip them with the skills needed to work on a commercial vessel. Held at Nhulunbuy High School’s Trade Training Centre, the students learned how to set off flares, use fire extinguishers, tread water, inflate life rafts and safely tow a boat. The course also involved theory on occupational health and safety and written assessments. Year 10 Nhulunbuy High School student Jesse Maymuru said the course had taught him important safety skills in a fun and practical way. “I didn’t know about the different flares to use for day and night and it was interesting to learn about the different fire extinguishers and which extinguisher to use for which type of fire,’’ he said. The training provides students with the skills needed to undertake further training and education or get jobs in the maritime industry including commercial fishing, transport and logistics, tourism and conservation and land management with the local sea rangers. Shepherdson College Maritime Academy teacher David Freier said his students extended their learning journey, sailing home from via the Wessel Islands.